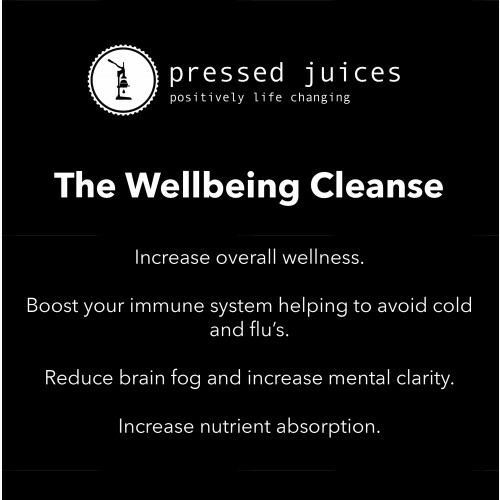 Pressed Juices wellbeing cleanse is perfect for those wanting to nourish their body’s and feel at their best. Wellness begins from the inside where a natural juice cleanse filled with fresh produce, can assist through the elimination of everyday toxic exposure. By focusing on a range of goals including: reducing inflammation, increasing energy, improving mental clearness and enhancing moods via naturally increasing serotonin this cleanse will leave you feeling amazing. Our body relies on a range of vitamins, minerals, essential fatty acids and hydration in order to run sufficiently and help you feel good. By supplying yourself with Vitamins A, C, E, B vitamins you can ensure you will support your immune system, create a gentle liver detox as well as fight against any inflammation your body may be experiencing all of which the wellbeing cleanse has to offer. Magnesium is an extremely important nutrient that is often overlooked and up to nearly 80% of adults may be deficient which can be due to: westernized diet largely filed with refined sugars/ carbohydrates & alcohol. We can either not be consuming enough or restricting its absorption. Magnesium assist with a range of benefits such as: increasing energy, calming the nervous systems, relieve muscle aches & pains as well as giving you a good night sleep. Magnesium can be found in a range of fresh produce including: spinach, almonds, cashews, avocado & bananas all of which you can find in our wellness cleanse. During the wellness cleanse you may practice light yoga to experience a holistic cleanse. Through deep breathing, gentle stretching and mindful movements your body will boost blood flow, increase circulation, enhance oxygen through your organs and further assist with toxin elimination.